The Just One Donna readers have spoken. I was curious about which dinner recipes were the reader favorites for the past year. Luckily, I have reports that give me the information with a click or two. Here are the five dinner recipes that were viewed the most is 2017. 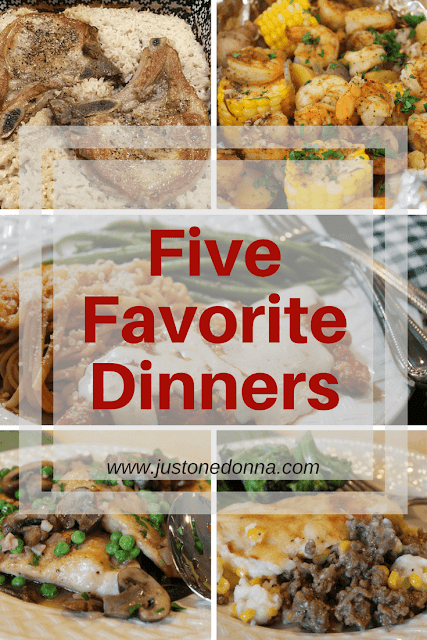 Each of these recipes is loved by my family and part of the regular menu rotation at my house. I'm happy the Just One Donna readers agree. It's time to give them a try if you haven't as yet. 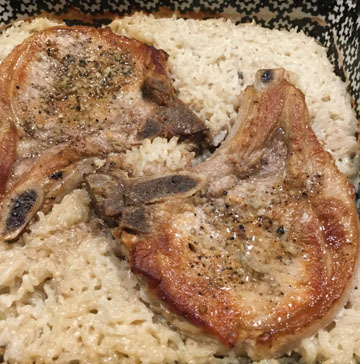 This pork chops dinner is a one-pan meal that uses prepared cream of mushroom soup and rice. It is hearty and yummy. 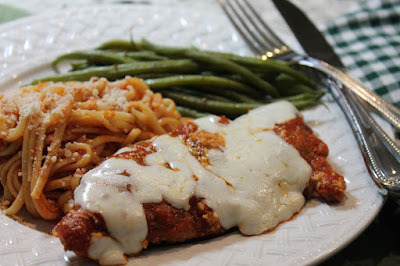 This recipe for chicken Parmesan uses jarred sauce, making this a quick and easy dinner to prepare. I like to make extra for the freezer so I'll have a meal ready-to-go on the busy days we all have. Shepherd's pie is always a family favorite. My recipe mixes ground beef and onions in a savory gravy, topped with corn and yummy mashed potatoes. Sometimes I'll add mushrooms to the ground beef mixture for even more flavor. This quick, thirty-minute, one-pan chicken dinner is one of my favorites, too. I love that it is a quick meal. I love that it is a one-pan meal. Most of all, I love that it tastes yummy! 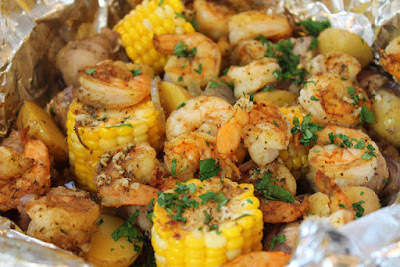 I'm obsessed with these shrimp-boil foil dinners. You will be, too. Just place all of the ingredients on a piece of foil. Seal the foil tightly and cook on your grill or in the oven. Bring a little summertime to your winter dinner table. Thank you for sharing this post with your friends on Facebook, Pinterest, and Twitter!